When you're heading to school, to work, or to the grocery store, it's convenient to tie your hair into a ponytail. Whatever errand you’re about to run, you've probably experienced the struggle of keeping your ponytail up all day. No matter how tight and secure your hair feels in an elastic, it's almost guaranteed your ponytail will be sagging in no time. But don’t worry! We have THE solution for those droopy, saggy, and sad ponytails. Using the right technique and product, you can keep your ponytail up all day! 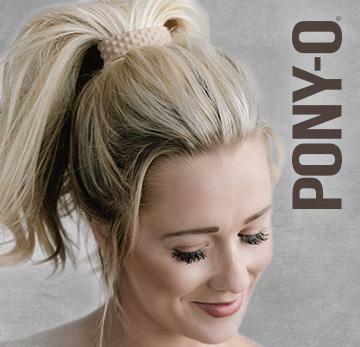 Prevent Your Ponytail From Sagging And Keep Your Ponytail Up All Day With Pony-O! Saggy and loose ponytails driving you crazy? Used to drive us crazy too! We’ve tested our Pony-O on thousands of customers, and we are confident it is the ultimate solution for your ponytail dilemma. It's all you need to keep your ponytail up all day...and all night, if that's an option! And it's SO simple, you won't believe it! Give Your Hair Extra Pizzazz! Pony-O is a superior hair accessory when it comes to giving your hair the extra pizzazz that you'll never get from elastics and bobby pins. Our patented, unique design instantly creates a fuller looking ponytail. Need more volume? Pony-O can help you with that, too! Did you know that a super tight ponytail can cause a headache disorder called “Extracranial Headache”? Click here to read more about it in a previous blog. Pony-O is lightweight and is designed to create comfortable tension-free ponytails. You’ll feel like there's nothing in your hair! Feed your hair through the Pony-O one time and shape it. There's no constricting your hair by feeding it back and forth like you do with elastics. No tension on your follicle...no ponytail headaches. Pony-O’s innovative design is what makes it different from any other hair accessory on the market. Unlike elastic bands, Pony-O BENDS and shapes to YOUR hair. It's more secure than 10 elastics, and feels like you're wearing your hair down. The silicone coating and malleable metal inside make the Pony-O completely hair friendly and able to hold any hair type securely, without damage. When you're ready to take your hair down, open the Pony-O back into a circle, and it slides right out of your hair! No more tangled and broken hair. No more hair coated elastics! Using your thumb and forefinger, pull your hair through the Pony-O. Holding the Pony-O close to your head. You can let go of your ponytail and hold the Pony-O with both hands. Squash and flatten your Pony-O. Using your thumbs, make sharp bends on each end. DO NOT bend the Pony-O once in the middle. If you want a tighter hold, bend the ends a little more. And viola! You’re all set with your gorgeously tied and perfectly secured ponytail! Unlike the traditional hair tie you’ve used your entire life, Pony-O is simply on a whole different level. This revolutionary hair accessory is designed to last hundreds of uses. Pony-O bends, it doesn't stretch like elastics, and never loses its shape. Pony-O is versatile. It doesn't matter if you have fine, thick, straight, or curly hair. Pony-O will hold it all. Pony-O will even hold shorter hair, securely. If your hair is at least chin-length, you're good to go. Keep your ponytail up and looking stylish all day. And if you forget to take it down because it's so comfortable, it's ok. Pony-O is great for sleeping. Experience the Pony-O difference and join the Revolution. Get yours here. Questions or comments? We'd love to hear from you!